Raccoon Medicine great power to show how to live in the Now. Raccoon Medicine implies creativity, dexterity, adaptability, thievery, curiosity, protection, shape-shifting, and discovering secrets. I walked outside side for my usually evening conversation with deer friends. After our greetings they brought my attention to a new friend standing in the background. As I looked, out of the darkness stepped Bandito, with Raccoon Medicine. He was sitting under the bird feeder picking up bird seed that had fallen to the ground. As I watch in amazement at how ambidextrous he was, I greeted him, he looked at me from behind his mask, and taught me this lesson in Raccoon Medicine. The magic of the Raccoon Medicine is in its mask, my tiny hands perform the task. No stone unturned, looking for that juicy worm. Something to eat, would be really sweet. Your transformation is here, thanks to the deer. Now is the time to let go of your fear. When Raccoon Medicine crosses ones path it is a good sign. He is a good protector. Raccoon is intelligent, cunning, clean, and very helpful. When one doesn’t know how to do something, make prayers, and a wish to Raccoon. Leave him some food, he will show how to resolve the problem !!! 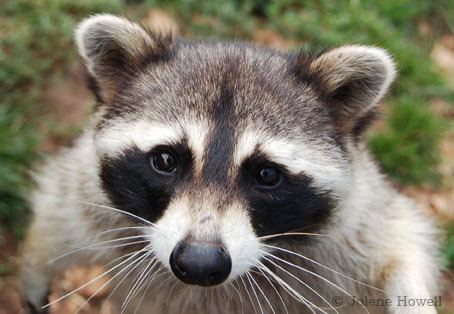 Raccoon Medicine can also be used as doctor power, hunting power, and protection power. Should one ever get lost in the woods in Nature, just ask Raccoon to help. He likes helping humanity. When Raccoon Medicine makes its presence known in your life, this little bandit may be saying, look around, see your strength at this time. It may be time to share your energy with some less fortunate. 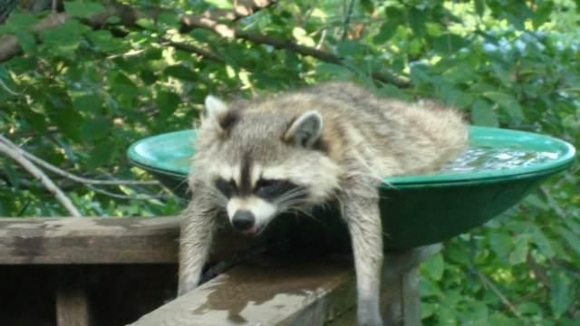 At the same time, Raccoon asks you to honor yourself, provide for your own needs, sow that you have enough power to give energy generously when it’s needed. Raccoon Medicine people have the uncanny ability to assist others without allowing them to become dependents. 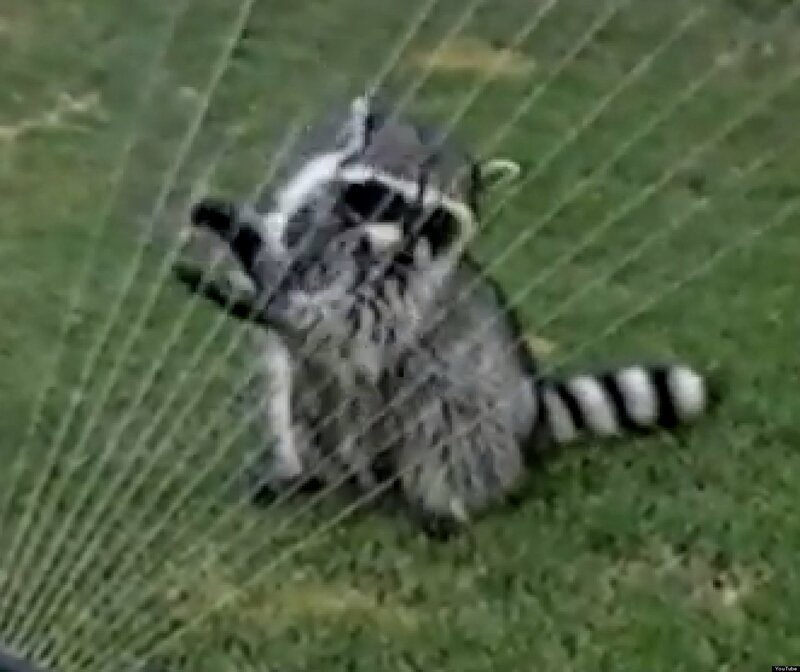 Raccoon selflessly tends to the needs of the tribe, before taking anything for itself. Raccoon teaches us the universal law of giving back to the source of our strength, guidance, and protection. We are reminded, benevolence and generosity always come full circle. What goes around, comes around. This creature-teacher, teaches us to find what we are looking for, and take only what we need… His association to thievery or stealth is quite common because of this. His digging for food is the method we can apply to digging for knowledge. 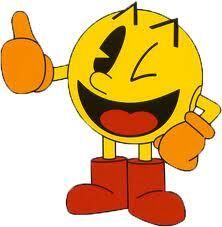 The mask he wears teaches, by utilizing the power of masks, or the power of shape-shifting, we can succeed. Shape-shifting teaches one to become what you want to know more about, you can discover the secrets hidden behind others and their ways. This leads to exciting adventures and explorations of the dimensional shifts and altered states of consciousness. Raccoon is a problem solver from way back. He has an innate curiosity, about how things work, and will encourage one to discover new ideas, and methods of achieving our goals. Intelligence is one of his strong points; combined with adaptability, and a playful nature he becomes an interesting and powerful teacher. Raccoon Medicine can show how to live in the Now, taking full advantage of the spirit worlds. His sense of family and hunting will serve well in providing for our own needs. Raccoon is a healer and uses the qualities of water to increase sensitivity, cleanse, purify, and soothing. Raccoons are fascinating animals. They are distantly related to the bear, thus Bear Medicine should be studied as well by anyone with this totem. The paws are very dexterous. 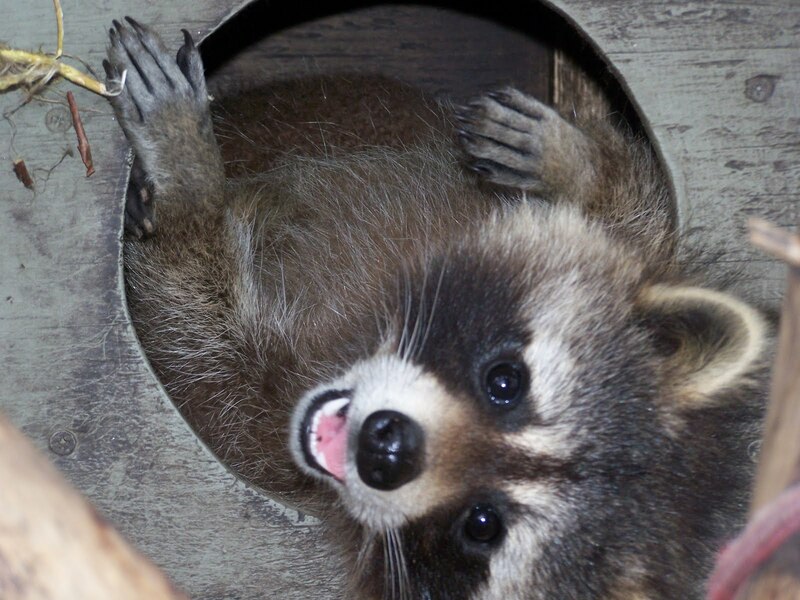 Raccoons can be expert at opening lids, latches, and doorknobs. Keep an eye on the cat or dog door! They will welcome themselves to your pantry. Because they often have the reputation for thievery. Being able to get into things they are not supposed to. It would not be surprising to find individuals who are thieves and burglars have Raccoon Medicine, even though it is not being used positively. The Raccoon will eat almost anything available. It will capture small prey but it usually eats mostly vegetables and fruits. This is something that those with Raccoon Medicine should keep in mind. Raccoons are extremely curious, which is partly why they often get into things they shouldn’t. They love to explore. Their nocturnal excursions can be likened to mini-adventures. They can be very curious about new realms and will examine anything that fascinates them. Raccoons are fascinated by water. They like to slosh their hands, and their food in it. This gives rise to the belief they never eat anything without washing it first. Actually, water increases the sensitivity of the Raccoon’s hands, and they can feel their food better. Raccoons enjoy hollow logs, especially for their dens. They will have one to two litters per year, with 2-7 young. 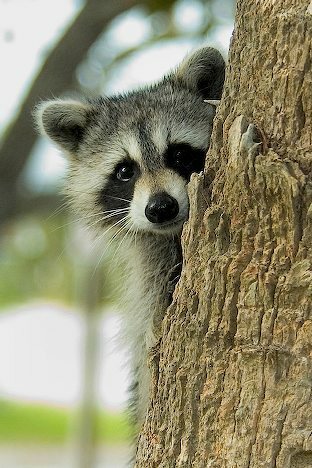 At about 20 weeks a Raccoon can live on its own, they are very sociable, and where there is one Raccoon, there will usually be others. They live longer than most animals in the wild, 10 years. When Raccoon Medicine shows up, it’s not a short-time totem, Raccoon Medicine will stay with you for a long time, seeing its influence for an extended time. Are you getting into things that you’re not supposed to? Raccoons are notorious and rather adept thieves. A curious demeanor, eager for exploration. These are common traits of Raccoon. 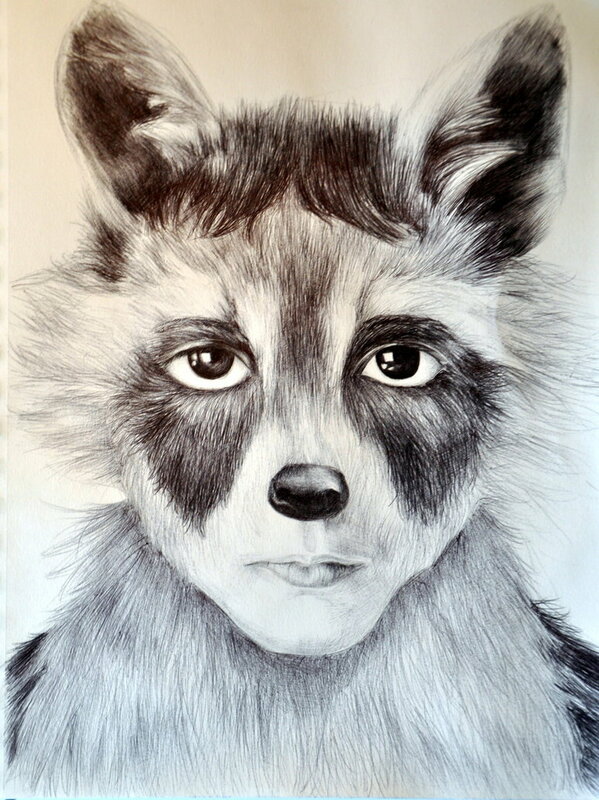 The Racoon’s mask represents privacy, ambiguity, and secrecy of some type. What’s being hidden and from whom? Dexterity, cleanliness, disguise, explorers, curious, secrecy helps the new transformations take place, balance curiosity with caution. Be courageous and self-defensive when need be, this lends to the sense of socializing with the ability to see the nature of the illusions and masks others are wearing. Thus to act differently with the various people encounter each day. Raccoon Medicine shows how to transform, this brings a new awareness to ones self. Raccoon is the Generous Protector, specifically, the protector of underdogs. 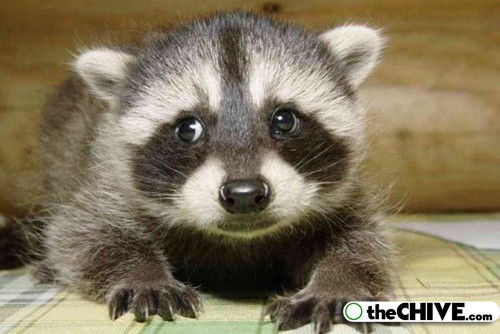 Raccoon symbolizes the generous protection of providing for the young, infirm, and elderly. Often called “little bandit” this Robin Hood animal teaches about generosity and caring for others. When Raccoon Medicine steps into the light, one is being asked to contact our “inner warrior” to become a protector, generous provider for those in need. 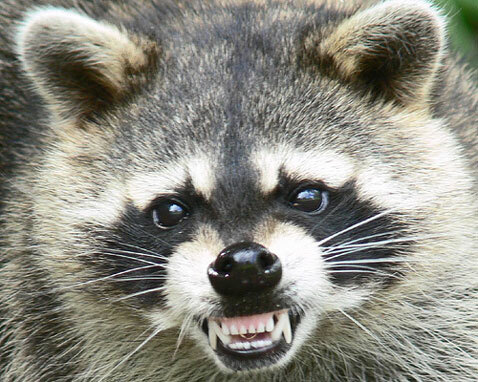 Raccoon is a ferocious fighter when need be, and highly temperamental. Raccoon leaves little room for those who would challenge his right to pursue his path. He will teach you to find your way and stick to it. This is the Heart of Raccoon. Follow your path with heart in it, and stick to it. A troupe of Raccoons scouting for food is often a hilarious exercise in generosity… After selecting their favorite morsels of corn, Raccoons always give the best tidbits to their Lookouts. He is always fed first by the raiders, to honor his vigilance as the group’s protector. This uncommon lack of greed, and altruistic behavior is rare in the world of humans. The most striking features of Raccoon is the mask that it wears. Although some associate this with thievery, it actually gives the Raccoon a very powerful mystical symbolism. Raccoon holds the knowledge of transformation through masks and disguise. This knowledge can be applied to religious and ritual practices as well, or within normal everyday life. Don’t we all present a different face to some people for greater success? Are you hiding your true self? Are others hiding their true self? Raccoon Medicine can find the answers. 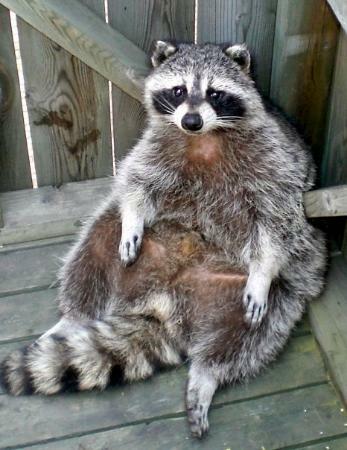 Raccoons do not hibernate, they do go into a heavy sleep during the winter, living off their body fat. This has connections to learning to use masks to put to sleep one aspect of ourself so that another can be awakened. This part of Raccoon Medicine can teach one to develop dexterity in using masks to achieve new altered states of consciousness and discover new dimensions of living. Raccoon Medicine symbolism is a message,… we sometimes need to wear different masks, sometimes you’re a boss, you’re a mom, you’re a coach, one can wear many masks in one day, and often do. However, they are all versions of our self. Just as with Raccoon, masks are a source of ambiguity and equivocation. When we wear a mask we are no longer who we thought. We make ourselves one with another force. We create a doorway in the mind, thus in the physical world, a threshold that we can cross to new dimensions and new states of beings. This is the magic of Raccoon Medicine. An expert of disguise and secrecy, it knows to wear masks for a variety of purposes. It can teach us to mask and disguise, thus transform to achieve altered states, for healing, and other ritual purposes. This practice has been a part of every society. Mask making is an ancient art employed all over the world. In Ceremony, celebration, and in magical practices. Concealed behind a mask, people become something or someone else. We can become whatever we want, by wearing masks. Masks are invested with mystery and power. They are tools for transformation. 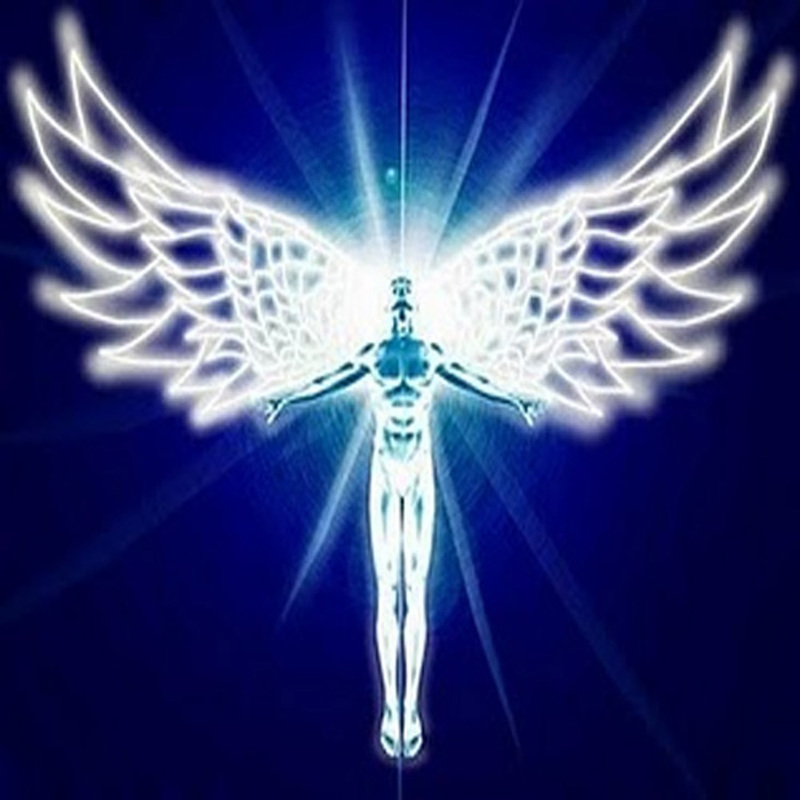 The hidden aspect, the secrecy, helps to promote the transformation. The Raccoon is greedy, (however so charming, he gets away with it), loves to indulge a hearty appetite with any kind of food he finds, old fish in the garbage, candy, or chicken snatched off the barbecue. 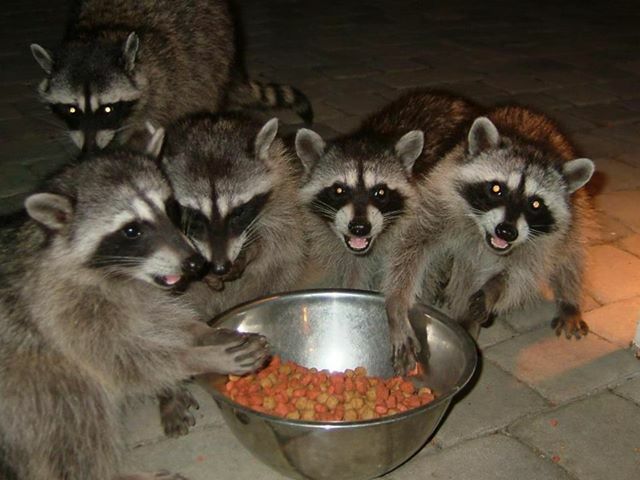 Despite such clever ways, Raccoon will always share his scavenged resources. Fond of the artful theft, he steals with innocent grace that comes off as virtue. Those with Raccoon Medicine might become irresistible enough to get away with almost anything. However, each must develop their relationship with Raccoon in their own unique way. Raccoon Medicine can teach how to become dexterous in the masks we wear. It can show how to wear a healing mask, or show the face we wish to become. Raccoon Medicine holds the knowledge of how to change our faces. If you are a Raccoon person, eating mostly fruits, nuts, and vegetables will be beneficial to your health. Hey Bandito, open the frig., hand me a beer this dog food is really dry. Raccoon Medicine helps us to change what we are, to what we want to be, giving us the magic of Raccoon Medicine. How would I look in a mask? Seek Crow Medicine and Spider Medicine for other lessons in Animal Medicine. Raccoon Medicine has great power for extended use in Transformation.